Would you believe me if I told you the creamy deliciousness below was a 3 ingredient homemade ice cream recipe without an ice cream maker? You better believe it! I don’t know about you, but no matter if it’s nearly 100° or even near 0°, I love ice cream year round. Mr. 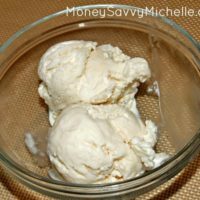 Savvy and I recently took a few nice relaxing days for a long weekend and I made this homemade vanilla ice cream recipe. Let’s just say it was SO good that I made 2 batches in 3 days. Yep, just for the 2 of us. I think Mr. Savvy ate 3/4 of it himself and says he is now ruined for his favorite store-bought ice cream. This holds quite the significance as Mr. Savvy is very picky about his ice cream. Let’s just savor the creaminess a moment more, shall we? I am so in love with this ice cream for a few reasons. First of all, it only takes 3 ingredients that a lot of us always have around the house. Secondly, it literally takes minutes to make, other than freezing time, and you can easily customize it to whatever flavor you want. The thing I love most is that it doesn’t take an ice cream maker and yet is the creamiest ice cream I’ve ever made. This is perfect for us because in our rental unit we have a tiny freezer that has no shelves and would be impossible to store one of the electric ice cream maker containers in. So, how do you make this homemade ice cream yourself? Just follow the super easy recipe below! Love chocolate? 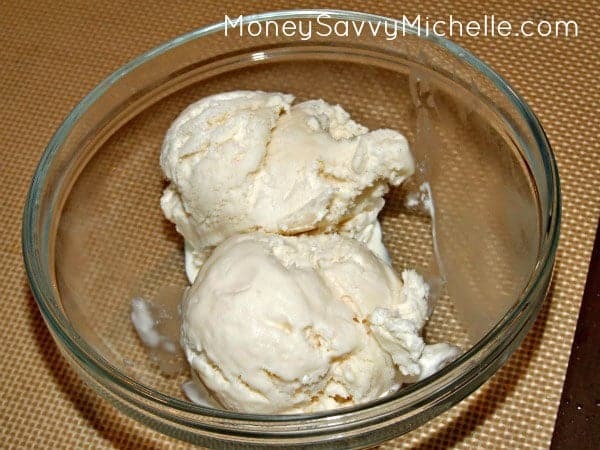 You’ll want to check out this Vanilla Fudge Swirl ice cream recipe as well! This super easy homemade ice cream recipe can be made into pretty much any flavor with a few extra ingredients. Best of all, you don't even need an ice cream maker! Whip cream with mixer or whisk until stiff peaks form. Make sure you use cream straight from the refrigerator or it may not whip up properly. Pour sweetened condensed milk into a large bowl and stir in your desired flavorings and/or mix-ins. For this recipe I added a splash of vanilla to my cream as it whipped and a tablespoon to the milk. I would have also added some vanilla bean if we had any. Pour into a 1.5 - 2 quart freezer-safe container and freeze for at least 6 hours. I like using this 7-cup freezer-safe container by Rubbermaid or a 1 quart + .5 quart deli/soup container. Serve and enjoy while trying to not eat the whole container in one sitting. This ice cream is very creamy so you usually don’t need to leave it out to soften to scoop. This can depend on how cold your freezer is or how many mix-ins you put in. 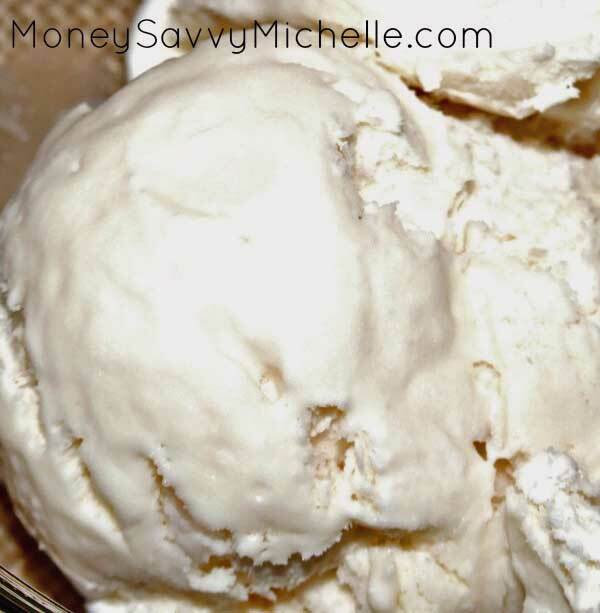 I hope you enjoyed this 3 Ingredient Homemade Ice Cream Recipe Without an Ice Cream Maker – be sure to check out our other recipes! This is a great recipe but I came up with a ice cream recipe that is even easier! Just mix in a bowl vanilla,sugar and milk! I don’t yet have measurements but mine was delicious! When the ice cream mix is done just put it in the freezer until it is as hard as you want it! Please note that when it is done it will be a little hard but you can always let it thaw. That is so great to know, thanks for sharing! Is this recipe in UK cups or US cups? Thanks for stopping by. All of our recipes are for US measurements. great recipe,added strawberries, blackberries & blueberries, I can taste bthe condensed milk. what did I do wrong? should I add whole milk to reduce the sweetness?